Eliminates the need for time-consuming and costly setup balancing and frequent rebalancing required by Circuit Setters. Is field adjustable from 100° to 160°F. Replacement is not needed if the target temperature changes. Reduces installation and maintenance costs. For any commercial plumber working on multi-unit structures such as apartment buildings and hotels, one of the most frustrating and labor-intensive tasks is achieving consistent hot water temps to all the domestic fixtures. It is one of the most difficult balancing acts you can imagine and much to the disappointment of many plumbers, it is a process that often needs to be repeated due to unauthorized or accidental temperature adjustments and seasonal changes in groundwater temperatures. Jeff Silverburg, President of JBS Plumbing, was all too familiar with this situation and it cost him time and money. Typically, his crew would have to get the first floor balanced, then move on to the second floor to make needed adjustments there. The second-floor adjustments would cause the first floor to be off again, and back they’d go to the first floor to make further changes. It is a classic case of one step forward and two steps back again. Silverburg said that it could take his crew three to four weeks to balance a hotel, and even then, he’s not sure they got it perfect. It can be so frustrating that some contractors will bring in a specialty balancing contractor, but more often, they go it alone turning valves hour after hour, day after day, and week after week to achieve something close to satisfaction. It’s that frustration that prompted Silverburg to try out the Acorn Controls TempFlow Thermostatic Zone Valve. Unlike the old technology widely available which is based solely on the flow of hot water, the Acorn valve is a thermostatically controlled zone balancing valve which automatically maintains the domestic hot water loop/zone temperature. By simply installing the valve after the last hot water device in each loop, it will self-adjust and balance the recirculated flow and heat loss of each TempFlow controlled zone. The valve’s ability to self-adjust ensures fast and consistent delivery of hot water to all fixtures all the time. The TempFlow is contractor friendly allowing for zone temperature adjustments from 100-160 degrees Fahrenheit (38°C to 71°C). A locknut on the bonnet prevents anyone coming along and making unauthorized or accidental temperature adjustments. An integral check valve and strainer prevents backflow and keeps performance-damaging debris from entering the valve. The TempFlow continually monitors the water temp in each zone and when a zone temperature is satisfied, it starts to restrict the flow in the zone. This process automatically balances the heat loss and flow, thereby forcing water to other areas of the building that are not yet balanced and/or still need hot water. Silverburg first gave the Acorn valve a try in a new 150 room Hampton Inn under construction in Scottsdale, Arizona. “The TempFlow is more expensive than flow control valves (aka circuit setters), but it’s worth it. I’d never buy anything else,” said Silverburg. The premium for the TempFlow more than paid for itself in the time saved and frustration avoided for Silverburg and his crew. If you look past the installed price, TempFlow helps installers and facility operators come out ahead in a number of ways. First, they save the labor to initially balance the system which can easily take 2-3 people nearly a day and gives installers the opportunity to reassign that labor more profitably. Secondly, a balanced system provides hot water to everyone 24/7 and makes for happy customers. Finally, using the TempFlow, the cost of seasonal balancing, with its uncertain impact on operating budgets, is no longer required. While the ground water temperature in the Phoenix area doesn’t fluctuate very much, contractors in regions that enjoy different seasons will appreciate not having to return to a building every spring and fall to go through the balancing procedure. The TempFlow worked so well, JBS Plumbing used it on their next project, a 225 room, five-story, Hilton Garden Inn in Tempe, Arizona. 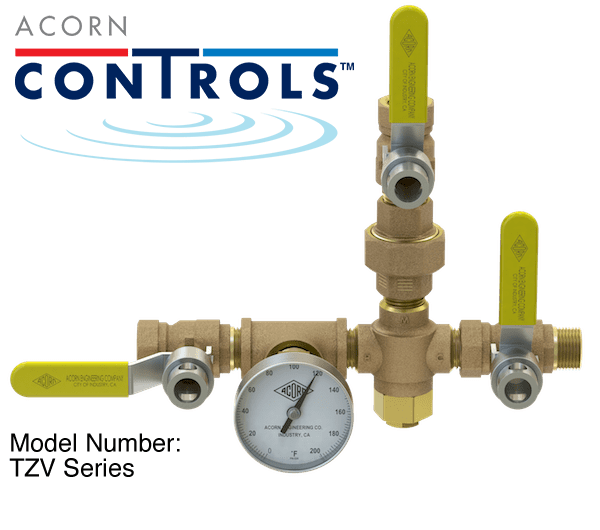 For more information on the TempFlow Thermostatic Zone Valve or any of the Acorn Controls products, please refer to our product page, or contact us.